There's been morning tea (orange pekoe) with a colorful towel - this is entirely for your benefit, I do not normally make tea with a tea towel underneath it, and my peony bush decided that THIS WAS THE YEAR to produce - I've been able to have peony bouquets for the past three weeks which is Very Thrilling Indeed. Aaaaaaaand every night we've been able to eat outside until the mosquitoes come to eat us. Oh and if you look oh so closely at the picture with the peonies, you will get a sneaky peek at my load of sheets that had come from the washer and dryer, and it's been sitting right in my front room for two days. And the only reason the table looks remotely clean is because I shoved all the piles to one side so that I could get a clear shot of the flowers. Also this is my menu plan for the week (are you getting the hint yet that I HAD NO PLAN for a post today??? I have a cool dollhouse post that will be very awesome.....when the pictures come off the camera and onto the computer. This is why I'm loving Instagram - take photo, quickly edit photo on the phone and onto Instagram it goes! It's fabulous!) anyway here's my menu plan that started on Sunday and will go to the end of the week: tuna sandwiches and chips and cold baked beans / quiche / hamburgers and carrot sticks and salad / leftover chicken on salad with dried cherries and goat cheese (Julia ate hers deconstructed with cheddar cheese) / frozen pizza from Trader Joe's / and penne pasta with chicken apple sausage and broccoli in a chicken broth-white wine-cream sauce. Thinking of meals for my family every week has become increasingly exhausting and a challenge, but I got this book and it's been a great great help. I'll do a post on it soon. Ok friends, I'm going to try really hard to get the dollhouse pictures sorted out and just in case you're thinking that I'm a Bad Blogger, I'll have you know that I went to not one, but two bookstores trying to find interesting things for us all to read this summer! I'm making progress. I'll show Andrew what the books are about, and then he'll hopefully say something entertaining and then we'll have ourselves a right proper summer reading list. How do you make your tuna salad? I tried to make it two days ago and it was AWFUL. Truly. Should I do a post on it, ha ha ha? How To Make Tuna Salad. I'll just tell you! I use Starkist Chunk Light Tuna in the drain-free bags. I used to just them in the cans, but now I use the already-drained kind. Whatever you use has to be drained VERY WELL. I usually make 2 of the family size packages so we have a lot for several sandwiches. Then I add a couple heaping big spoonfuls of Best Foods Mayo - has to be that kind - and I'm using a big soup spoon, so there's a fair amount of mayo going in, but not so much that's it's all runny. I mash this with a fork for a bit. Then I add a big handful of grated sharp cheddar. My mom made it this way and that's just how I've always done it. I mash that around and then maybe add a bit more mayo if the cheese has made things look too dry. And that's it! I don't do pickle relish or anything like that. And I don't season it. When I was little, I thought the perfect picnic lunch (because my mom did it this way) was a tuna sandwich on wheat bread, with cold baked beans, and sweet baby gherkins and chocolate chip cookies. 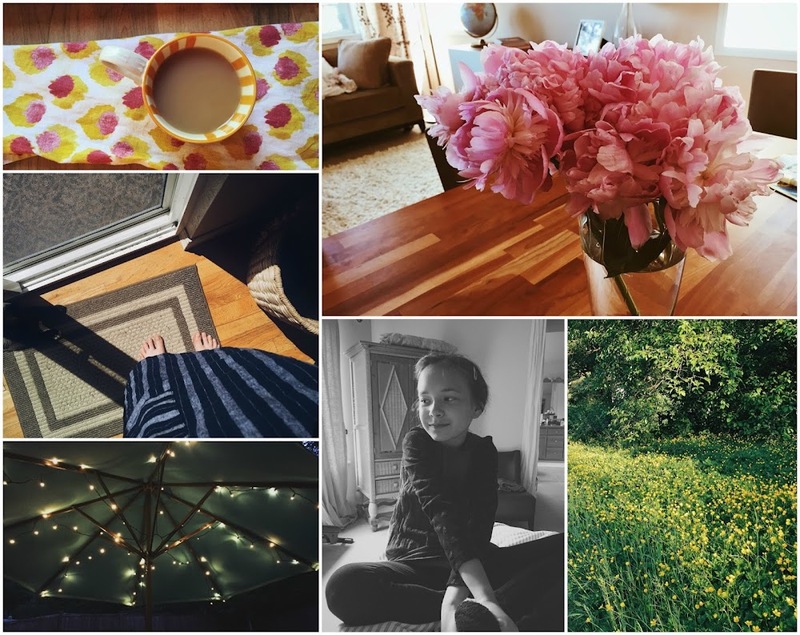 I love your home life photos!! Your tea looks delicious, and your peonies are gorgeous! Your dress is also very pretty! Where is it from?? I am finding that I am loving dresses this summer. I bought a really cute one at Talbot's last weekend. I've never tried a frozen pizza from TJ's, but I will pick one up the next time I'm there. I do love their pizza dough, though. That's what we are having for dinner tonight - homemade pizza thanks to TJ's!! The dress is that one I linked to in a Friday post a couple weeks ago - sometimes those list serve as a personal shopping list, ha ha ha! It came from Old Navy just recently, and there was another color I think? But I got the blue striped one and I really love it! Only prob is that it really needs a strapless bra, (or no bra??) because bra straps totally show, because it's kind of a boatneck, halter top affair, but I don't care, I just pretend my bra straps are part of the design, ha ha ha! I really like the Trader Joe's frozen pizza AND making pizza with their dough! If you get the frozen kind, just don't overcook them! They are very thin and crispy and can easily get overdone. I feel like they taste like the kind of thing you'd get in some European cafe, they have a tasty sauce! Your lights are so pretty!!!!! also, Andrew is also ready for fall. he's always ready for fall. i'm very afraid of what the spider situation is going to be like this year b/c we had such a mild winter! I need a patio umbrella just so I can do lights. I love it. Those buttercups are gorgeous and I love your peonies and that you didn't crop the pic. sniff. I miss those peonies! it was a good 3 weeks or so that I had them!! BTW the wood grain of your table is gorgeous. i'm so sorry, just now seeing this, it went to spam! ??? thank you so much! !